The Classical Period in music falls between Baroque and Romantic. Music from the Classical period was composed between c1750 and c1820. But, as I explained in the first section of this history, ‘Classical’ has become a general term and includes music from the Baroque to present-day. Like the Baroque, the Classical period in music coincided with the classical period in art and architecture. During the classical period, many of the features of music which we understand today were established such as composition, presentation, and style. The basic organisation of the orchestra was laid out and expanded, the piano and clarinet were invented, and instruments such as the oboe and bassoon were refined.Traditional Baroque instruments such as the harpsichord fell out of use, to be replaced by the newly-invented piano. Musical “forms” (structures) such as Sonata Form were developed during the Classical period. The “symphony” (a work for orchestra, usually in three or four “movements” or sections) developed as a distinct musical form (the composer Joseph Haydn was instrumental – forgive the pun! – in the development of the symphony) and the “concerto” (a piece for solo instrument, such as the violin or piano, and orchestra in three or four movements) became an important piece for virtuoso (“showing off”) playing skills. Melody: music from the classical period has a distinct tune or melody which is heard above an accompaniment. There is less weaving together of tunes (“counterpoint”) than in Baroque music, which makes Classical music sound simpler and clearer. Shape: greater use of phrasing and “cadences” (stopping points in the music) to mark out distinct sections of the music. Some of the most famous pieces of music were composed during the Classical Period, such as Haydn’s great choral work The Creation, Mozart’s Eine Kleine Nachmusic (‘A Little Night Music’), and Beethoven’s Fifth Symphony. The best way to get to know more about Classical music is to listen to it. Joseph Haydn (1732-1809): often called “the father of the symphony” (he wrote over 100, some with famous nicknames such as the Surprise, the Hen, the Clock, the Drumroll) or by his nickname “Papa Haydn”. Also wrote many piano sonatas, developing this form more fully. Also string quartets, choral music, and more. Haydn was Beethoven’s teacher for a while. Wolfgang Amadeus Mozart (1756-1791): considered by many people to be not just the greatest classical composer, but the greatest composer ever. 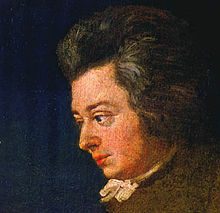 Mozart was a “child prodigy” (very gifted) and started composing music when he was 5. He played and wrote for kings, queens and other royalty all over Europe. He composed over 600 pieces of music, including symphonies, concertos, sonatas, string quartets, operas and choral works. 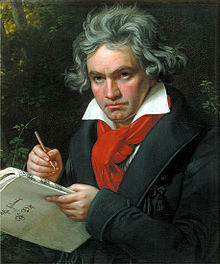 Ludwig van Beethoven (1770-1827): Like Mozart, Beethoven is one of the greatest composers of all time. He wrote 9 symphonies, and his last symphony was revolutionary with its ‘Ode to Joy’ in the final movement, a song for solo singers, chorus and orchestra. 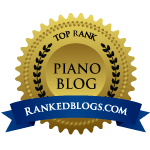 He wrote 32 piano sonatas (including the ‘Moonlight’ Sonata), which span his entire adult life and show how his musical style developed and changed, and 5 concertos for piano. He wrote string quartets, sonatas for piano and violin, and for piano and ‘cello, choral works and even an opera (‘Fidelio’). He was fiercely independent, and had a reputation for being very grumpy. Of course, the most famous fact about him is that he went completely deaf – and yet still managed to compose some of the greatest music ever. His music was so original that he invented a completely new style of music – Romantic. Franz Peter Schubert (1797-1828); Schubert greatly admired Beethoven, and was very nervous the first time he met Beethoven. He asked to be buried next to Beethoven when he died – and he was. Despite dying at the age of only 31, he produced a huge amount of music, including over 600 songs, as well as sonatas for piano, and piano and violin, symphonies, string quartets and choral music. He bridges the Classical and Romantic periods in music. Romantic music is all about moods and emotions: Schubert’s music can be very emotional, with rapidly changing moods and colours, from desperately sad to amazingly beautiful. He had a fine sense of melody and when playing Schubert, you should never forget that he was a composer of songs.